Sharkoon has made a name for lower price but still great looking computer accessories from mice to fans to computer cases and everything in between. Most notably, they sell primarily in the European and Asian markets and are looking to spread their influence into the US. The CA-M is their next offering into the expanding tiny case market. Is this mighty mini a good case to reach into our market with? Let’s see! For a fan of large and spacious computer cases, reviewing small cases is definitely a challenge. 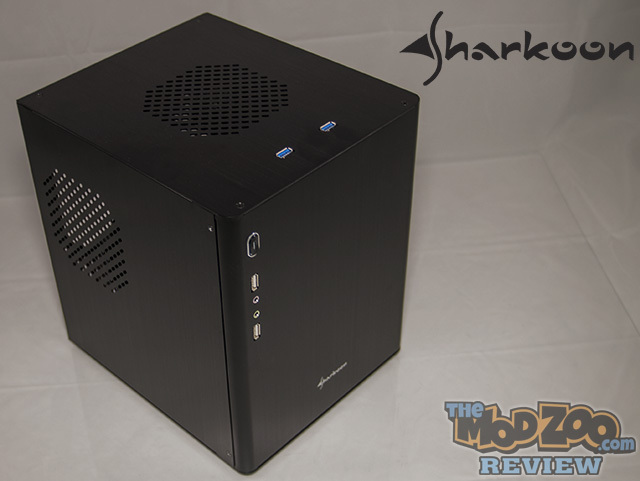 Sharkoon’s CA-M MATX case is only my second Micro ATX format review, and it continues to highlight why I don’t personally LIKE the smaller form factor. However, these reviews have been opening my eyes and pushing me to understand WHY people like these teeny, tiny cases. They have their places, and in time, I may end up choosing one to have a place in my own home. As you can see, there’s a decent listing of options and features for a tiny case. Ultimately, how well did the case stack up? I see a lot of modding potential, Great article Jeremy! Very nice review Jeremy. But my biggest gripe with it, and a lot of cases with a similar design is why are the buttons and that on the front??? They put the USB 3.0 on the top why on earth would you not put the rest of the stuff up there also? That leaves a perfectly smooth canvas on the front of the case for modding and also makes for a very clean look for HTPC’s and similar uses.